I don’t know about you, but I look terrible when I travel. Not intentionally of course; jet lag notwithstanding, it’s impossible to look crisp and put together after an extended journey by public transport, no matter where in the world you are. My problem has more to do with my style of travel — or lack thereof… There are two real options when you’re a backpacker: clothes that look good, or clothes that are comfy. Now, bearing in mind you’ll be spending quite a lot of time in them — alternating between the same two pairs of trousers every day until they drop off you and disintegrate — it’s not much of a choice. Is that because I’m a guy? Maybe — see the note about my wife at the end of this post. But I don’t care whether you’re male or female, there’s something about being a backpacker that makes keeping up one’s appearance a constant challenge. However fastidious you are about your personal appearance (and most backpackers I know are! ), however much you shower before an 18-hour bus journey, you’re still going to look (and smell!) pretty bad afterwards. If you look like your passport photo, you’re too ill to travel. Many countries have these in some form or other, and the richer the country the more expensive and interesting gear you can pick up for next to nothing. They’re perfect for replacing an item of clothing that is giving up the will to live in your backpack; or something you’ve become so sick of wearing you daydream constantly about burning it. This shops are incredibly cheap, so you can go crazy — and then just give the stuff back when it’s time to move on. I don’t travel with any technical clothing, so when my wife and I decided to do a two-month, 1,000 km hike, we had to equip ourselves from scratch — on next-to-no budget. Guess how we did it? Yup, “op shops” they call them in Australia — we visited every one. In a couple of weeks we had all the gear we needed for the hike — plus all the money had gone to charity! And when we were done, we gave most of it back as donations (except the t-shirts, which were too stained to be of use to anyone). Fisherman’s trousers in Thailand, those crazy-colored woolly trousers in South America — pseudo local fashions are cheap to buy, fun to wear and, if they don’t become a souvenir, easy to dispose of before onward travel. I say “pseudo local” because real locals wear the uniform of the world: jeans and a fake Nike T-shirt. Or a Manchester United strip (shirt and shorts). 3) Take any opportunity to wash. Looking posh is a moral boost, and should be possible for most of us bedraggled travelers just by shaving and wearing all-clean clothes! I also travel with a shirt — just one — which transforms a pair of jeans into an outfit smart enough for a nice restaurant or swanky bar (well, as long as they don’t look at my feet, on which I have either flip-flops or hiking boots…). The rest of the world will be. Seriously — for every sweat-wicking-fast-drying-wind-proof-mesh-venting-ThermaCELL-layering-system you own, there’s another person behind you who has none of it. And you know what? They look a lot better than you! This is why so much “technical” clothing ends up in charity shops (see above) just waiting for you to pick it up — people with lots of cash buy it, don’t use it for anything more strenuous than shopping, then realize that it looks pretty crummy when compared to clothes that were, you know, designed to look good whilst shopping. So they ditch it. You should too — or at the very least, stop paying outrageous prices for the stuff. Unless you’re headed to Everest Base Camp — in which case, buy it all from those people who’ve just realized that no matter how expensive it was, it doesn’t look right in Sainsbury’s. Obviously, this is a bit of a male perspective on things. My wife swears by traveling with a small (for an elephant) bag of “essential” make-up. It’s the main reason she’s recently swapped her rucksack for a suitcase…but she assures me it helps her feel good about herself when otherwise she’d look as bad as I do. So I indulge her. What do you do to look good while you travel? Tell us in the comments section! STAY TUNED for tomorrow’s post, a review of a new book on Asian beauty. 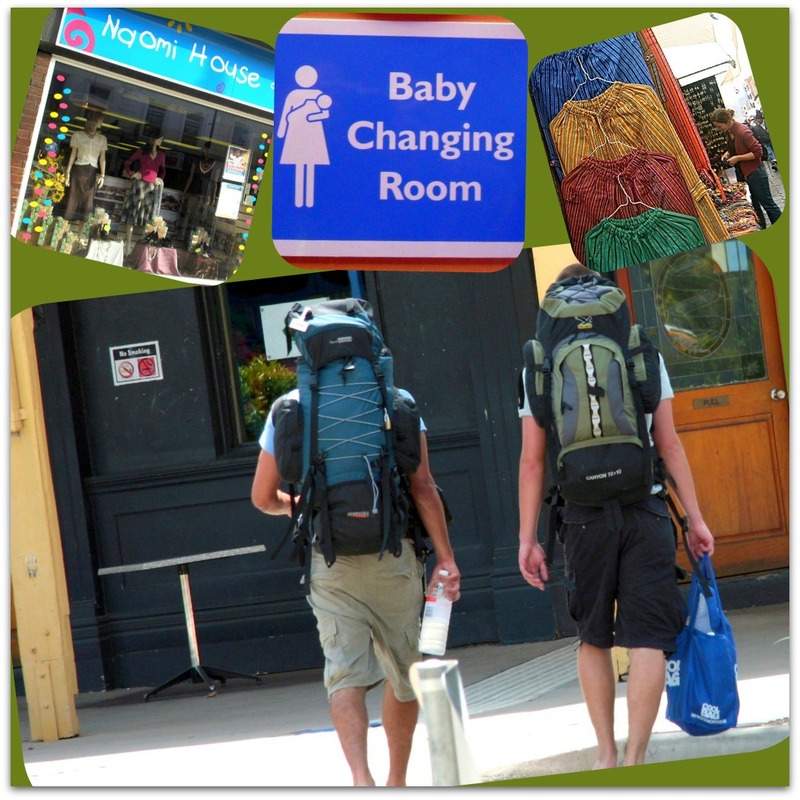 Images: (clockwise beginning top left): Charity shop in West Street (© Copyright Basher Eyre and licensed for reuse under this Creative Commons Licence) baby changing room sign and South American wool pants for sale, by Tony James Slater; backpackers (Morgue photos). I agree with your wife. I always had a lippy in my backpack, and a little black dress. I liked this! As much as I love to travel, I end up looking a complete mess the entire time. Whenever I go overseas, my flat iron gets ruined(even when using a converter!) and I’m left with my crazy curly mess of hair. I don’t know what I do to look good while traveling. Like your wife, I carry my makeup, face and hair products in my backpack and try to ignore the added ten pounds it seems to add to it. Other than that, staple clothes that are versatile and can be dressed up or down! Loved this post, it made me laugh because it’s absolutely true. Ha! It amazes me, the number of people that travel with curlers or straighteners – one day, when I run a backpackers hostel, I’ll buy some good ones and rent them out. I’ll make a fortune!! Glad you enjoyed the post Michelle! But then I am a cynic when it comes to technical clothes. They had a sale at Khatmandu over Christmas, it’s one of the biggest retailers of that stuff – they had up to 75% off. It brought the prices of their clothes to just lightly more expensive than the top brands of regular clothes… Argh! That’s exactly what one of the milliners here in the East Village told me when I asked her about hats with SPF this & that — she said any hat with a brim will protect your skin, no need for specially treated fabric! Goodness, are we consumers gullible or what? !